Ed Lifton was self-employed in the food business. Not really concerned about being involved in the community. Doing what he needed to do to keep his head above water. Then someone encouraged him to ride in The Wellspring Foundation’s inaugural Lake2Lake Ride for Rwanda. Ed had been riding his older steel-framed bike to work everyday and thought he should check the ride out. While researching he found out the ride was a fundraiser for the Wellspring Foundation for Education: a nonprofit working to empower the next generation of Rwandan leaders through education that transforms lives. It impressed him. This was not just a commercial event, filling someone’s pocket at the end of it. It was to help those less fortunate, it was for something bigger than money, bigger than himself. That’s when it hit home. He had never done anything like it before. He registered. He rode. He finished. Ed was the oldest rider of the inaugural Lake2Lake, but that didn’t hinder him. He was supported the whole way through encouragement from other riders & volunteers. “The support team made it possible,” he stressed. Sure he went into the ride a little naive—on an older steel framed bike and with no idea of the commitment needed to go 220km—but he did it. And, he wants to encourage you to do it as well—it had a tremendous impact on his life. 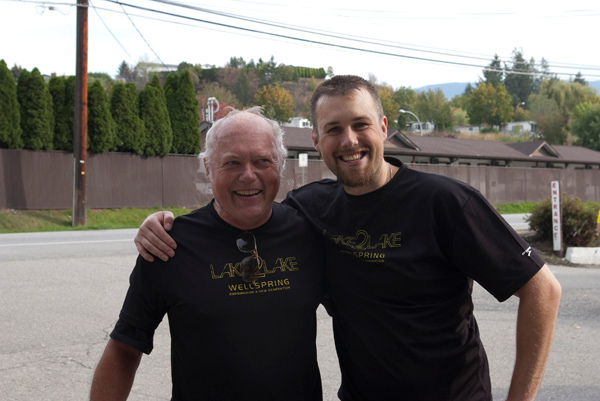 “Since riding Lake2Lake, I have been motivated to make changes in my life. I was very conscious about my weight and over the winter I lost 25lbs. I’m [also] making a commitment to get involved more, to contribute to the community,” says Ed. Ed retired a couple of weeks ago. What did he do to celebrate on the Canada Day long weekend? He went on a 2-day Kettle Valley Railway ride in the Kootenays—motivated by his experience at Lake2Lake. Lake2Lake helped him realize he could do it. Ed is committed to riding Lake2Lake this year: “I was on the first one. Healthwise I’m feeling really good, I want to continue [riding] for many years.” Oh, and yes he’ll have a different bike this year! Inspired by Ed? I am. Why not join us in October on the Lake2Lake Ride for Rwanda? Early Bird Deadline is July 31st! wow,he is so great.i can see the vigour from him.Life lies in movement.i can know it now. I am myself regular cyclist, not so young and not having special rode bike, only hydro commuter one. But this man gives me inspiration and motivation that I could do something like him too. From 1 ‘old fogey’ to another: looking forward to riding the L2L with Ed etal.